“They’ve suffered alterations, damage but we’re very optimistic at the find and all it represents,” archaeologist Claudia Rodrigues was quoted as saying by the AFP news agency. The skull is understood to have been stored in a metal box inside a cabinet, described as a “strategic place”, which helped it resist fire damage. 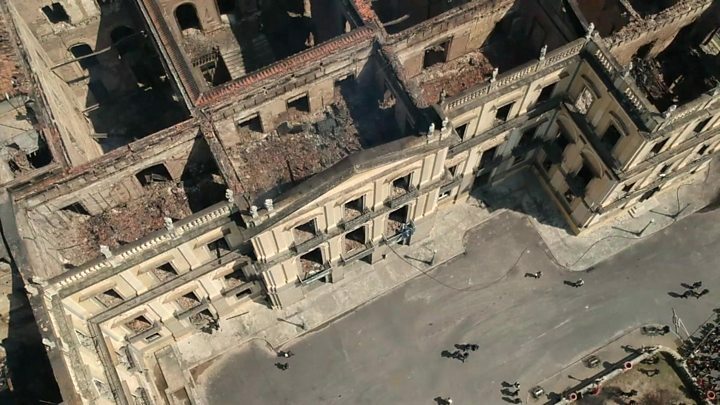 Structural work to secure the historical palace in the Brazilian capital is still being carried out almost 50 days on from the fire. The cause of the blaze – which tore through hundreds of rooms containing more than 20 million artefacts – is still under investigation. The 2 September fire sparked criticism and protests of the country’s government in its aftermath. The museum is managed by Federal University of Rio de Janeiro, whose rector said they had known the building was vulnerable because of financial cuts. Luzia’s remains were found in a cave in the 1970s in the state of Minas Gerais, north of Rio, by French archaeologist Annette Laming-Emperaire. Tests suggest the skull and bones belonged to a woman in her 20s who was just under 1.5m (5ft tall) – and they were believed to be the oldest recovered on the continent. Experts had produced a digital image of her face using her skull, which was used as the basis for a sculpture that was also in display on the building. Luzia was named in homage to Lucy – the famous and important 3.2 million-year-old human remains found in Africa in 1974.